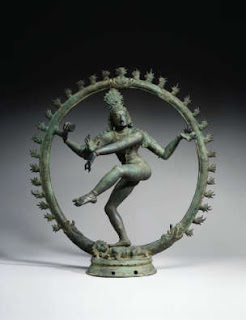 Shiva as Nataraja, Lord of Dance, at once destroys and re-creates the universe. Based on the rhythmic, graceful postures of classical Indian dance, the supreme deity's cosmic dance signifies the end of each cycle of time, or kalpa. The flames encircling his halo and held in his upper left hand symbolize destruction and the promise of re-creation. In his upper right hand, the drum and its sound represent creation or the beginning of time. His other right hand is posed in the gesture meaning "fear not," and his lower left hand points down toward his raised foot. This gesture represents the illusionistic qualities of worldly existence; the raised foot signifies the final release from the cycles of existence and promises salvation. In his dance, Shiva tramples the dwarf Mashalagan, an action symbolic of his victory over evil and ignorance.